Wine Screen Shots Wine is a program that allows Windows programs to run under other x86 operating systems without necessarily having to have Windows. 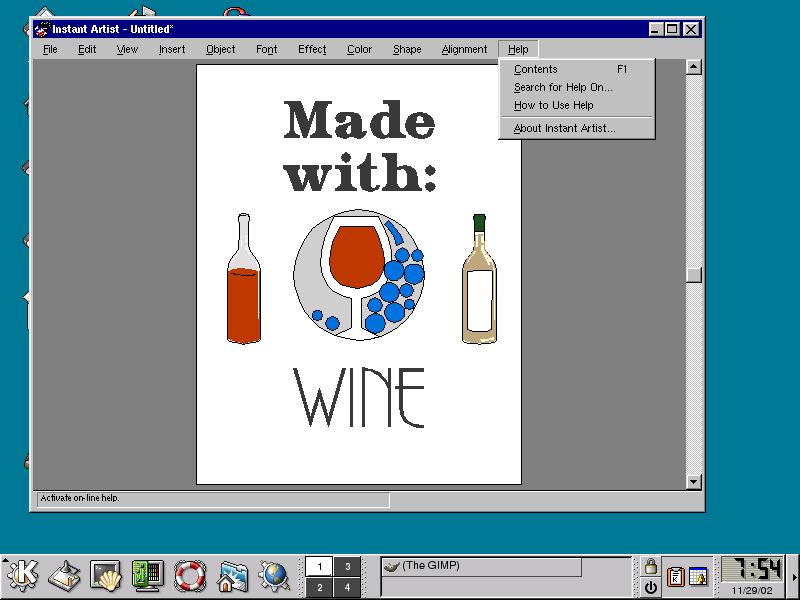 Although Wine is not in itself a GUI, it can run a certain application program that Microsoft has made central to their GUI. More proof that Internet Explorer is not as "integrated" as Microsoft says it is. 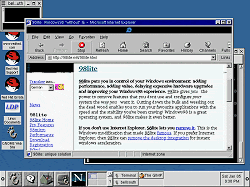 The above is a real screen shot of the Windows 98 "integrated" version of Internet Explorer 4 running under Red Hat Linux 6.1 - no copy of Microsoft Windows is actually running. 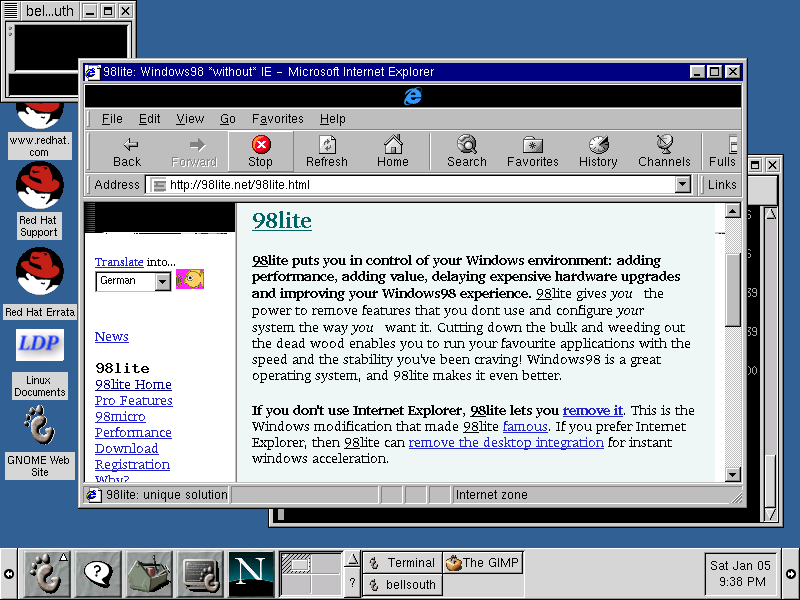 Ironically it is displaying a page about 98Lite, a program that installs Windows 98 without Internet Explorer. 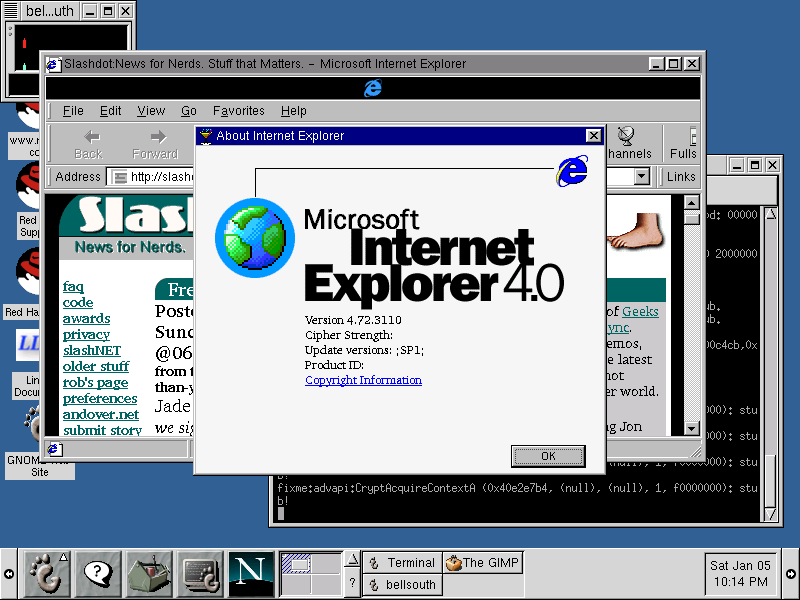 IE 4 without Windows 98 and Windows 98 without IE 4... now how is this supposed to be integrated? Wine can only run application programs, it can not run operating system components such as VxD drivers or the Windows kernel itself. Applications run by Wine can not access the hardware directly or make use of internal Windows structures that are not simulated by Wine. Interestingly when Microsoft released IE 5 they stopped referring to it as an application program and started referring to it as an "operating system component". For some strange reason IE 5 runs under Wine... just like an application. 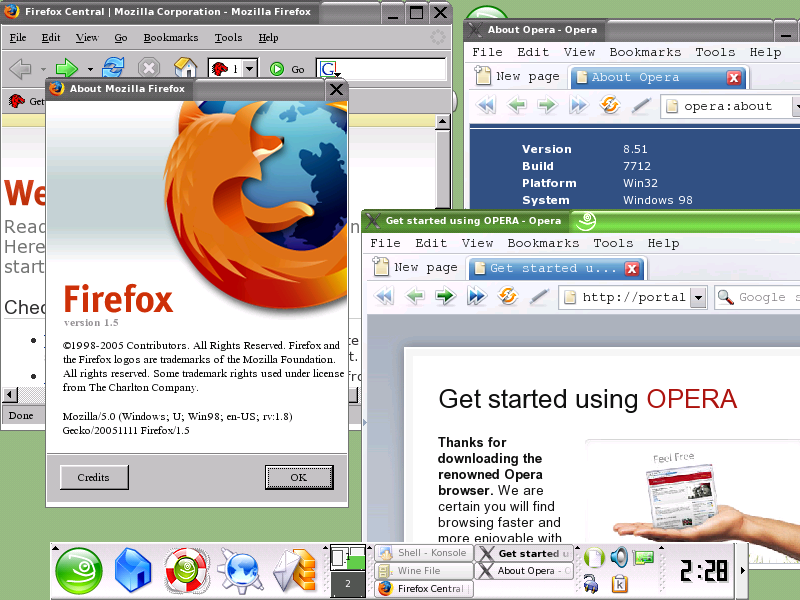 So now Linux users can view those obsolete web sites that only allow IE! Microsoft is so generous to give away their browser for free and can now run under other OSes... or are they being generous? "IF YOU DO NOT HAVE A VALID EULA FOR ANY "OS PRODUCT" (MICROSOFT WINDOWS OPERATING SYSTEM PRODUCT, ANY MICROSOFT WINDOWS NT WORKSTATION OPERATING SYSTEM, OR ANY MICROSOFT WINDOWS NT SERVER OPERATING SYSTEM), YOU ARE NOT AUTHORIZED TO INSTALL, COPY, OR OTHERWISE USE THE OS COMPONENTS AND YOU HAVE NO RIGHTS UNDER THIS SUPPLEMENTAL EULA." 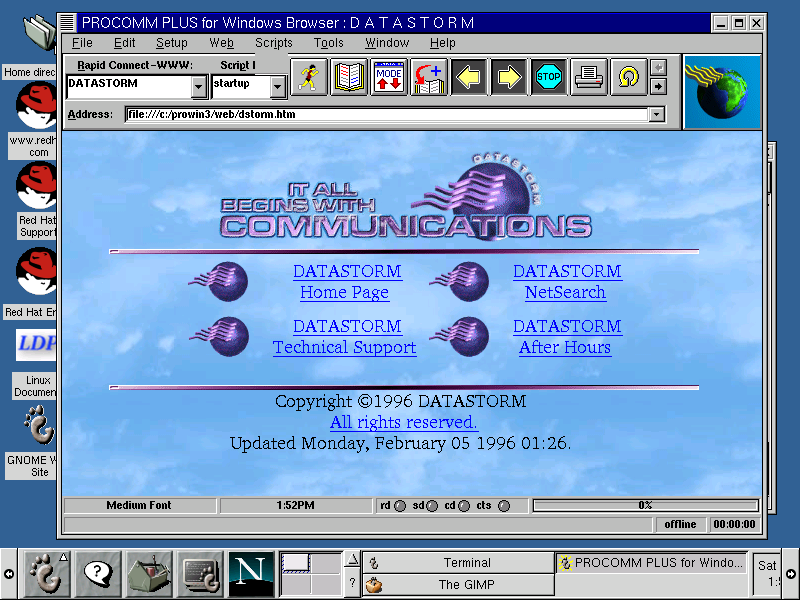 "OS components" is referring to the Internet Explorer web browser application. Microsoft forbids you from installing the Windows version of IE under any other OS. Which, of course is just silly. As far as I know IE is the only web browser that has such a restriction. 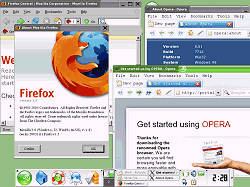 Firefox, Netscape, and Opera for Windows are more than happy to let you run them under Wine or a Win32 compatible OS such as ReactOS. This leads to an interesting problem. 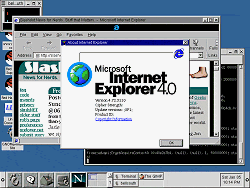 Since all new Microsoft apps and even many non-Microsoft apps now require IE, Wine has had to re-implement large chunks of IE and its APIs to enable programs to run "out of the box" without IE. 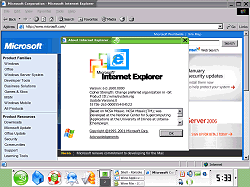 But if I may make a suggestion, if you are developing a Windows application DO NOT REQUIRE IE! You will benefit because your application, unlike Microsoft's, will be able to run on more platforms. IE 6 and no Windows! Look Ma, no Windows! 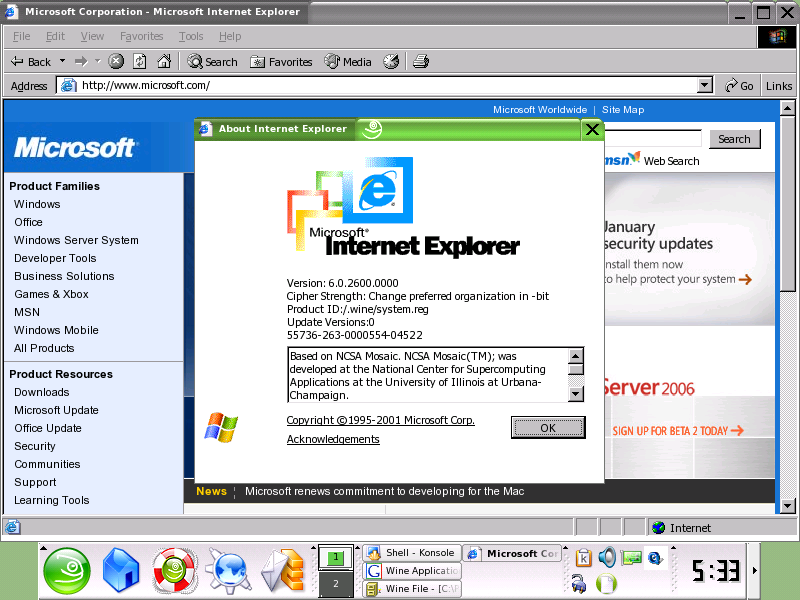 And installing IE 6! I could be wrong but someone might be getting their EULA violated. 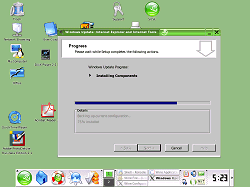 It's pretty funny in a sick sort of way watching this software that is labeled as "Windows Update" install and run on a non Windows OS, because as we all know by now it's just an application program like any other. 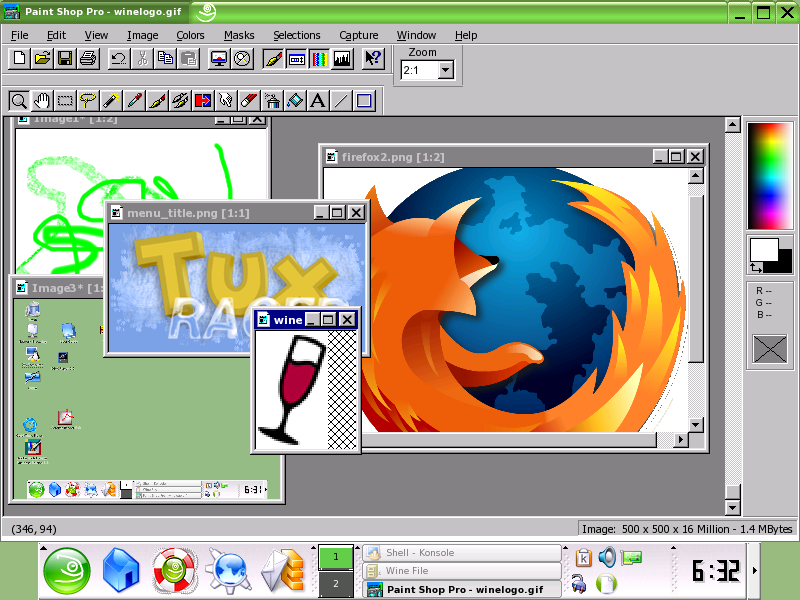 The Windows versions of Firefox and Opera running under Wine. I am actually allowed to do this! *GASP*! Anyway, after showing Bills "OS component" running without the OS, this screen shot seems appropriate. 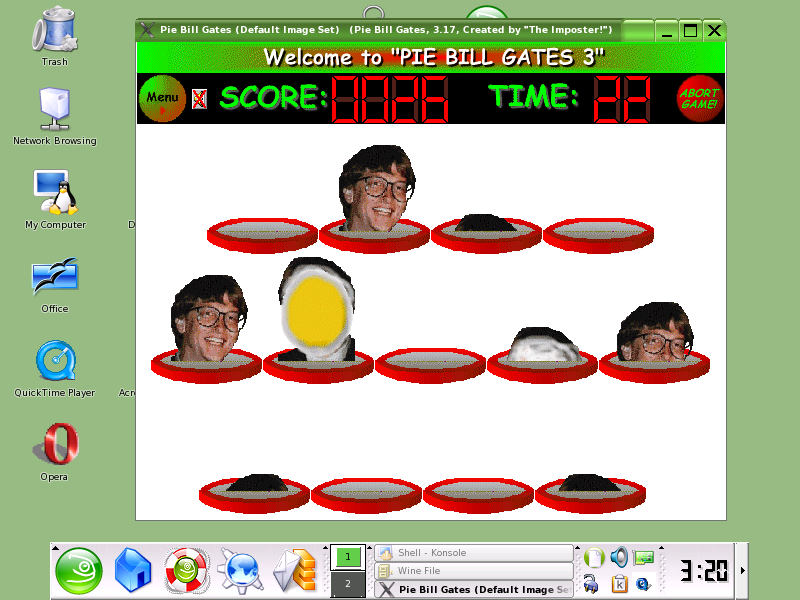 Here is one of my favorite games, "Pie Bill Gates" running under Wine. Wine can run many more Windows application although rarely 100% correctly (Wait! Even Windows can not run Windows applications 100% correctly!) it is still in development and constantly improving. 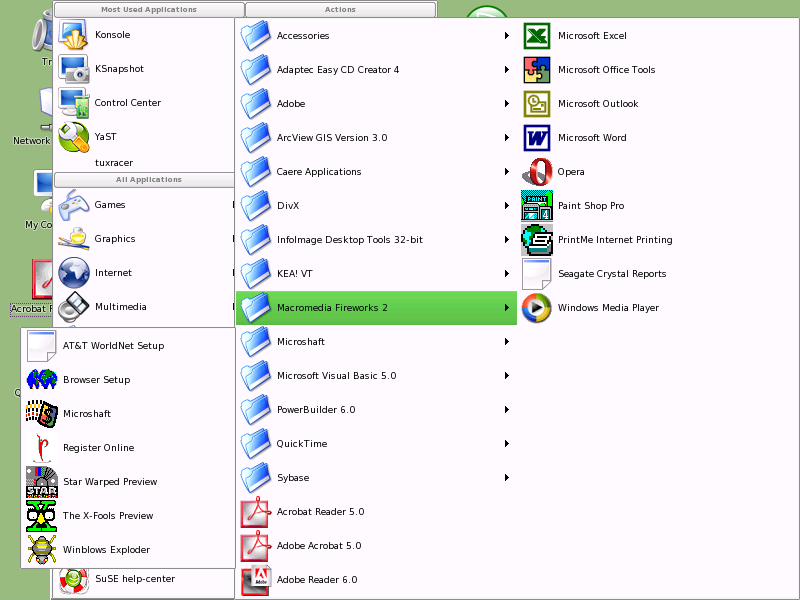 I updated most of these screen shots using Wine 0.9.5 under Suse Linux 9.1. I tried throwing as much software as I could at it to see what would run right "out of the box" although some of these did need some configuration tweaking to get them to run. Although Wine is intended to be a transparent subsystem it now has a few simple applications intended for managing Wine. 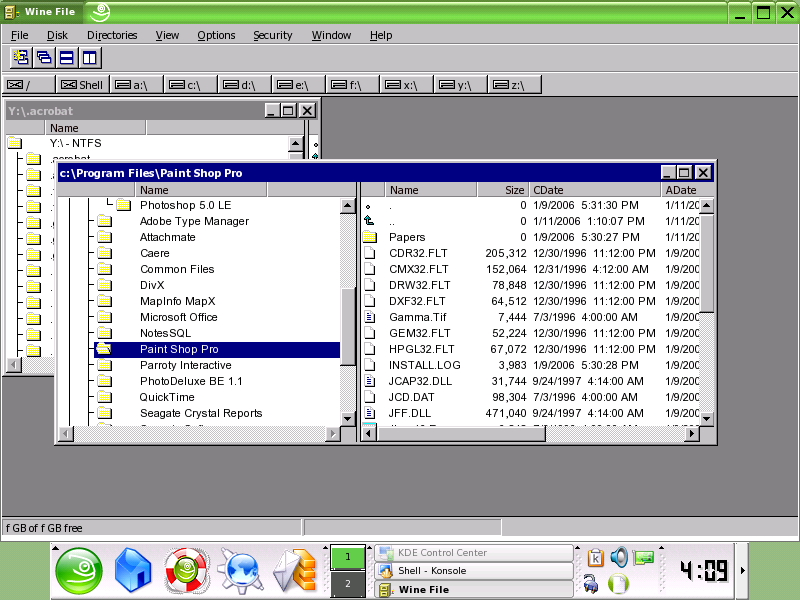 First is WineFile, a simple file manager. It also now has its own control panel so users can easily get to any control panel applets installed by applications. 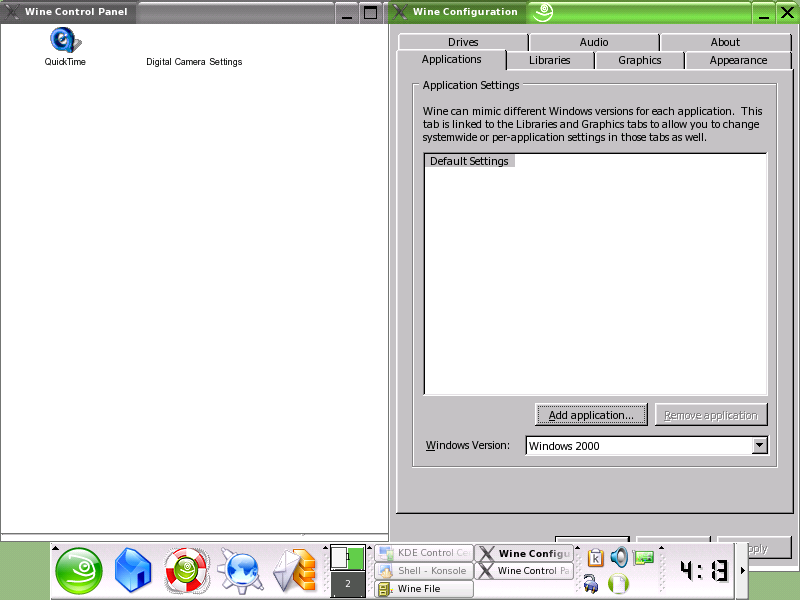 And most importantly is WineCFG that provides a graphical way of specifying application compatibility settings. 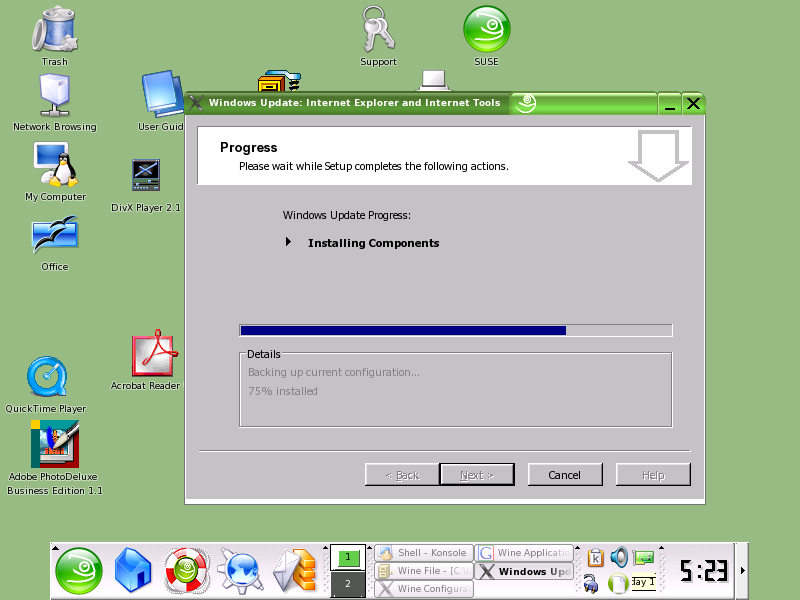 Finally, depending on the installer, many applications may automatically create "start menu" icons. 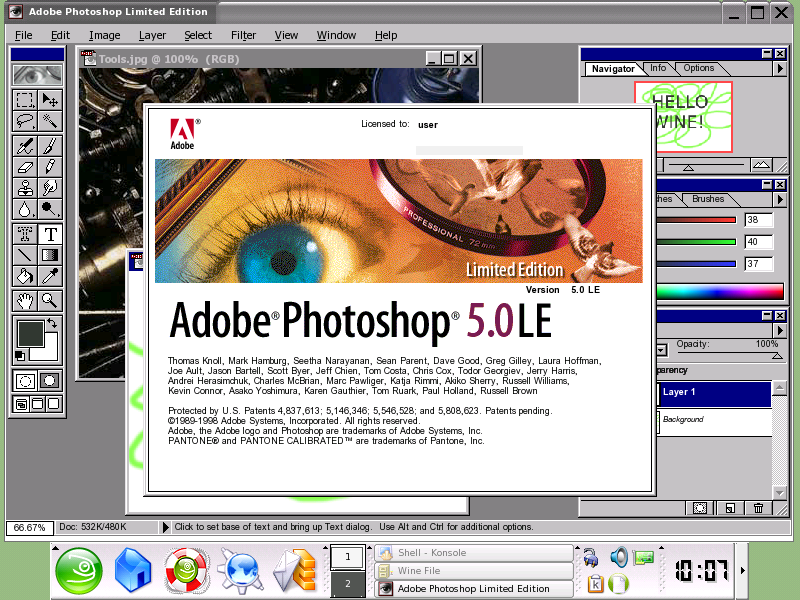 Adobe Photoshop 5LE that I got with my scanner. Installs and seems to run perfectly with no tweaking. 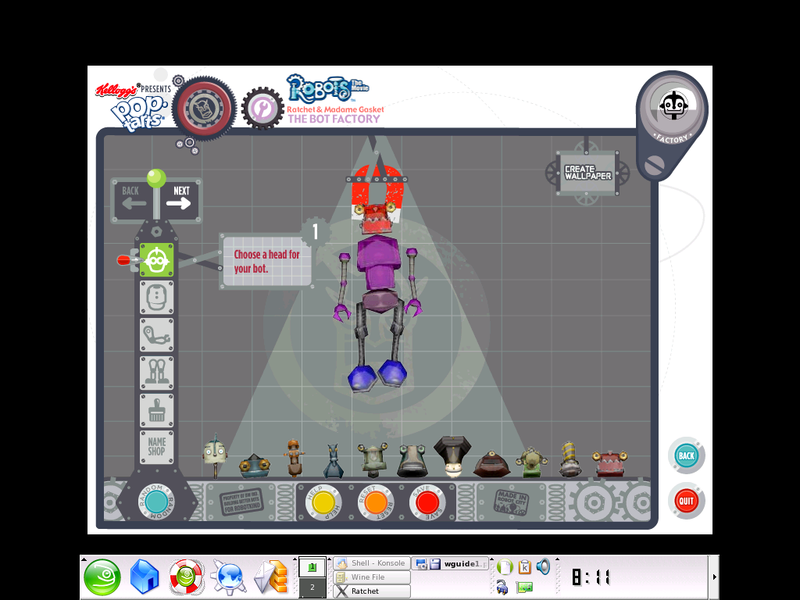 Paint Shop Pro 4, an application I use almost every day, runs perfectly. I literally pulled this "Robots" CD out of a box of Pop Tarts. Just for laughs I tried it under Wine and it works! It is mostly written in Macromedia Flash which works fairly well under Wine. 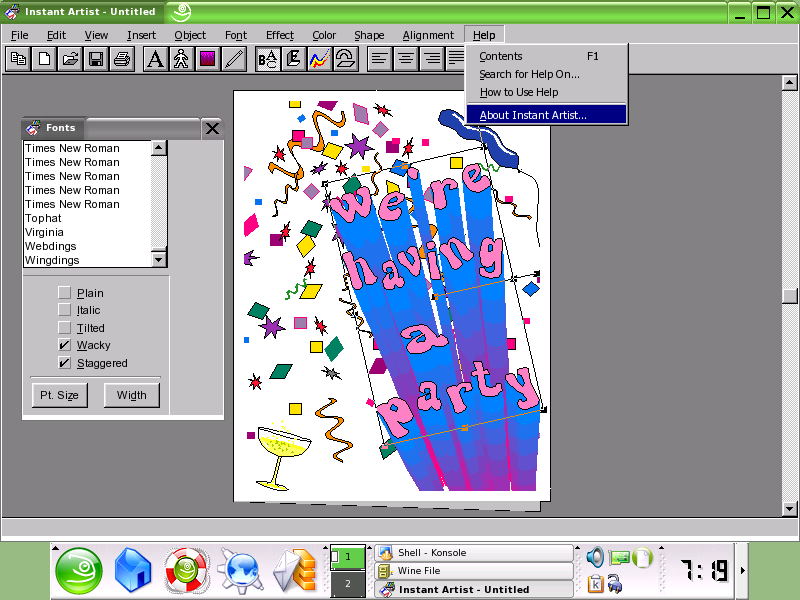 Instant Artist is a great Windows 3.x program like the famous "Print Shop" that can make signs, banners, greeting cards, and envelopes. And it runs and prints nicely under Wine. 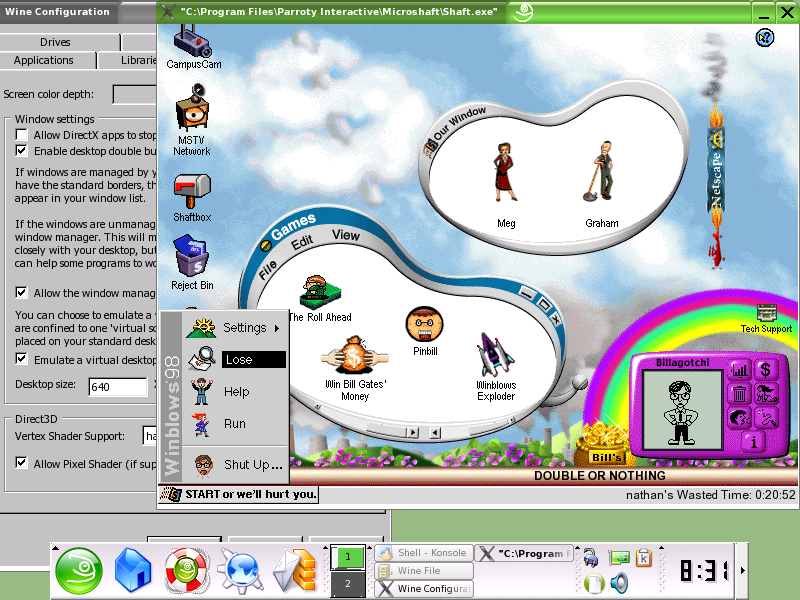 Apple Quick Time 6.5 for Windows. The UI shell had some odd flickering but the movies played fairly well. Microsoft Media Player running under Wine. 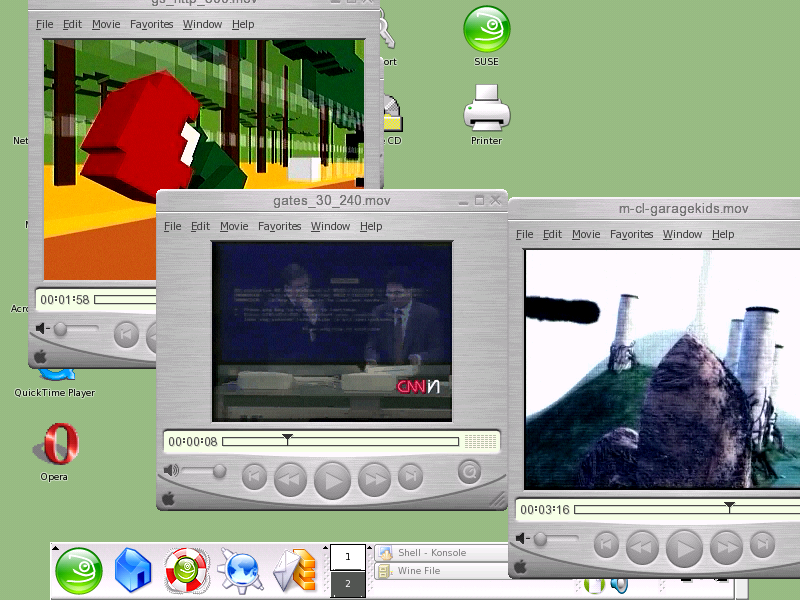 Reportedly Wine can run Media Player 7.x. 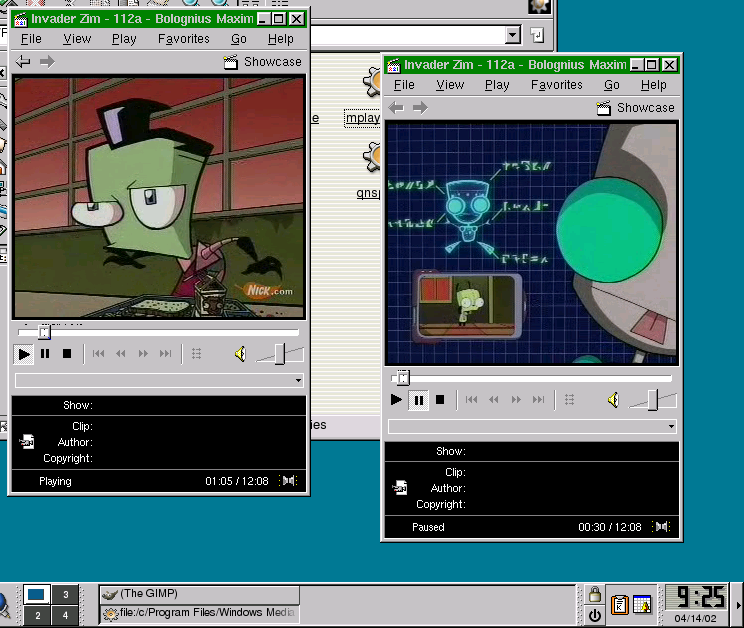 Of course you can always just add the WMP 7 and 9 codecs to Media Player 6.x. 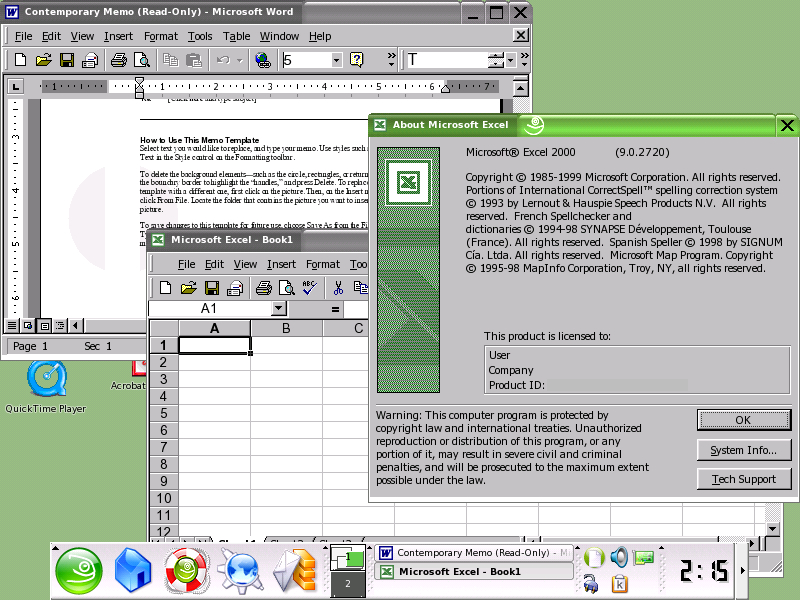 Microsoft Office 2000 - One of the main purposes of Wine is to be able to run Microsoft Office. 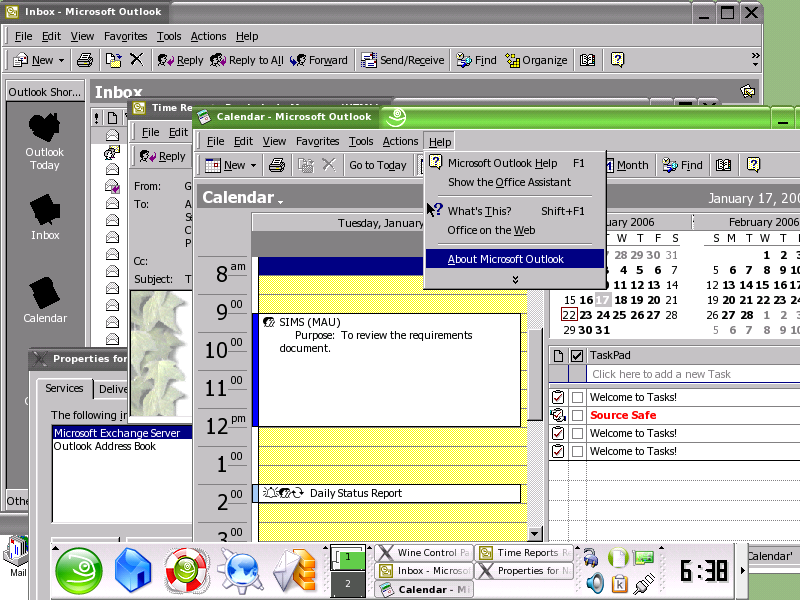 Office 2000 runs nicely although the Office Assistants don't work - but arguably that's a feature. Microsoft Outlook 2000 - MS Outlook (not to be confused with Outlook Express) is currently the only program that can get the full functionally out of an MS-Exchange server. Exchange with Outlook is very popular in corporate environments because of its built in calendar / scheduling software. Supposedly this works right out of the box with Code Weaver's wine, but here is what I had to do to get Microsoft Exchange Server support to work under Wine. 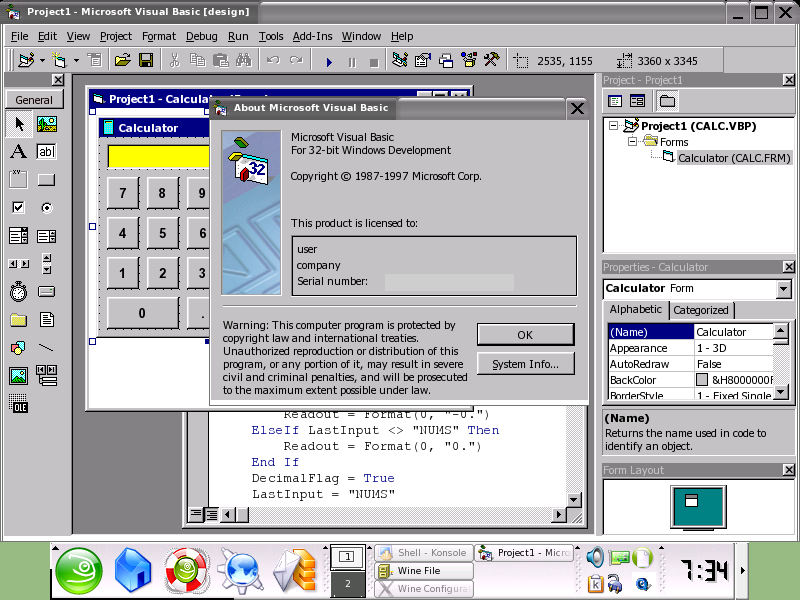 Sure, everyone else is busy running VB 6 under Wine but here is VB 5, the last version of the VB IDE not to require IE. 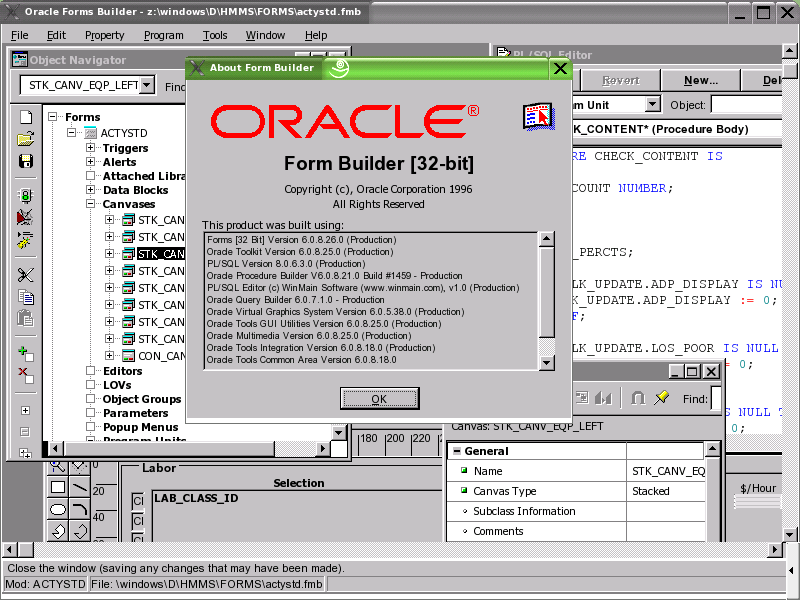 Oracle Forms and Forms Builder 6i. Seems to run great except for a problem with the "Open" dialog crashing. 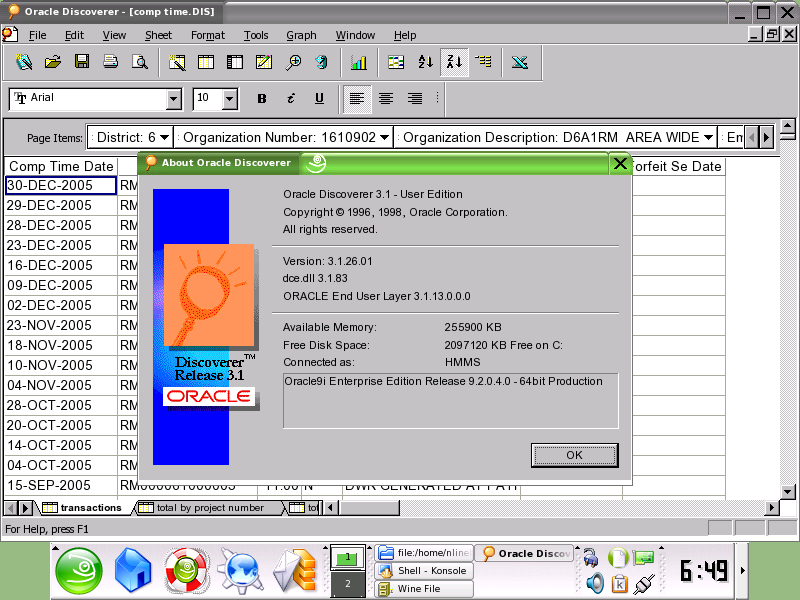 Oracle Discoverer 3.1 works and successfully uses the Oracle client to connect to a database. For whatever it's worth Arcview GIS 3.0 runs. The Microsoft Remote Desktop Client seems to work, although it didn't even try to autocreate my printer on the server. Printing is a very important thing! 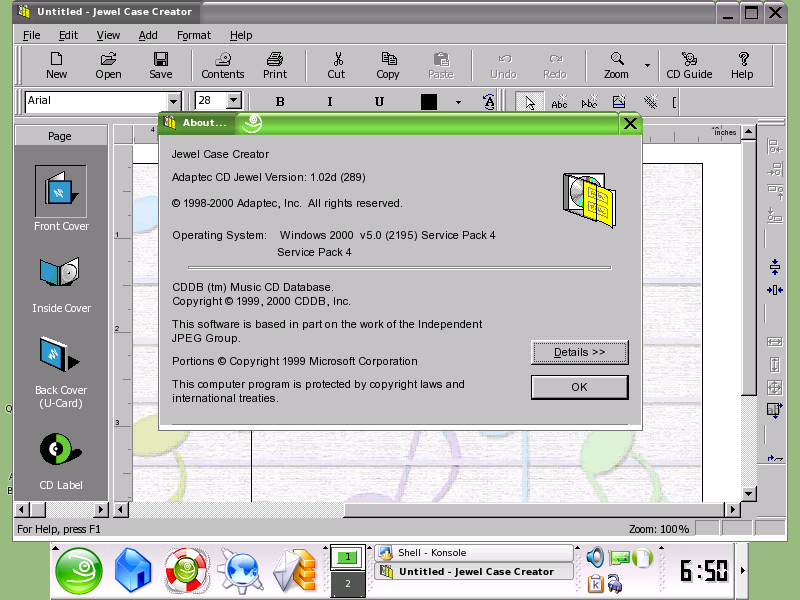 The Adaptec Jewel Case creator that comes with some CD burning software. 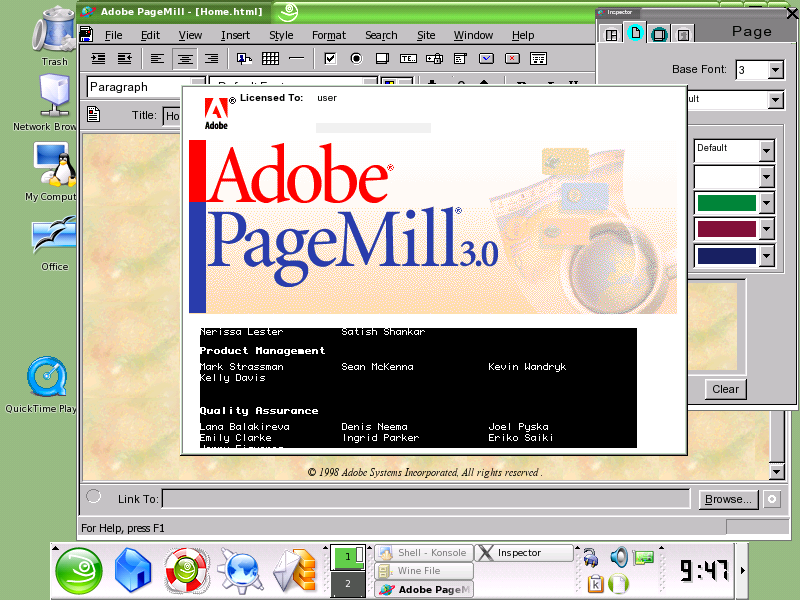 Adobe PageMill seems to run. The Power Builder 6 IDE.starts up and runs although it crashed on me loading some sample programs. 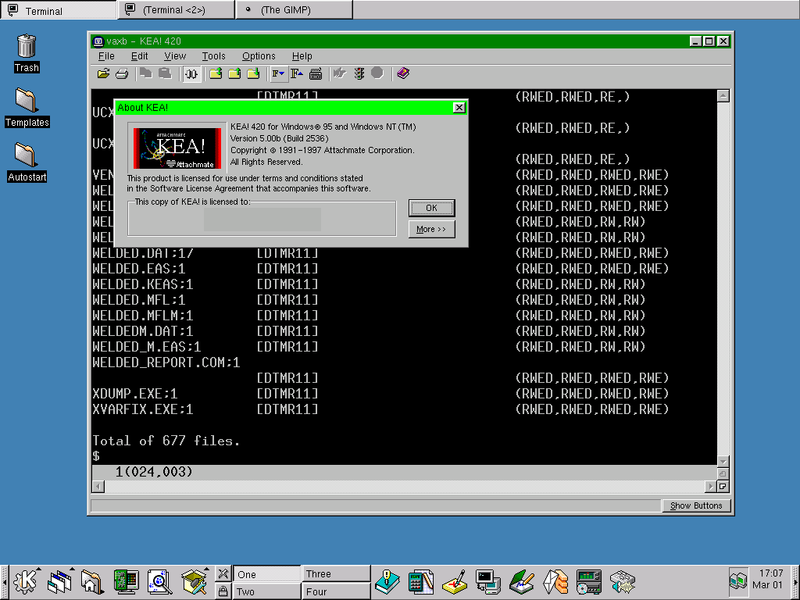 Attachmate KEA VT420 - A terminal program I use under Windows. Just what Linux needs, another terminal program! Ha! 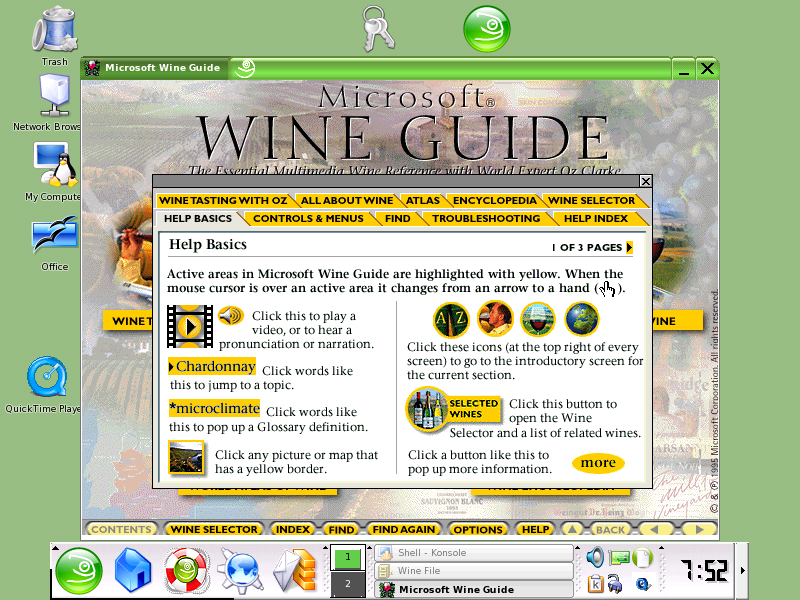 Microsoft Wine Guide running under Wine. 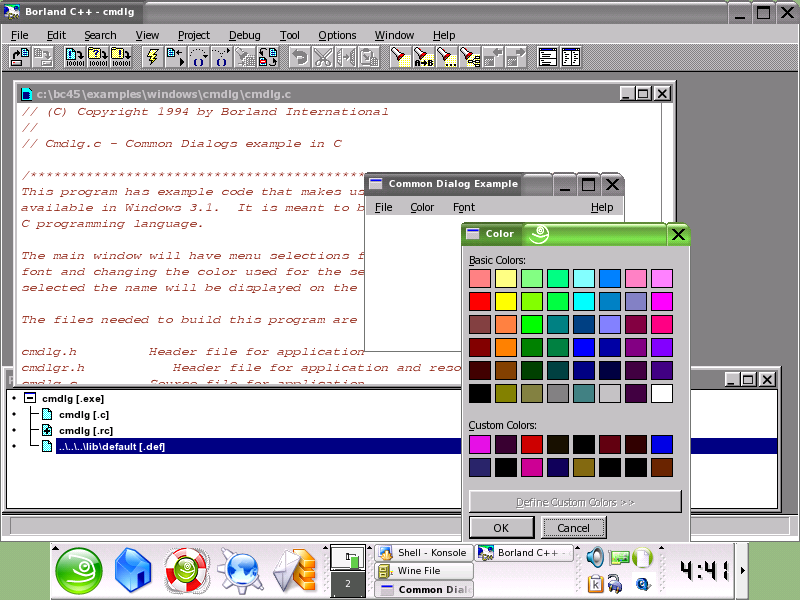 this picture shows a number of older 16-bit Windows 3.1 application running. 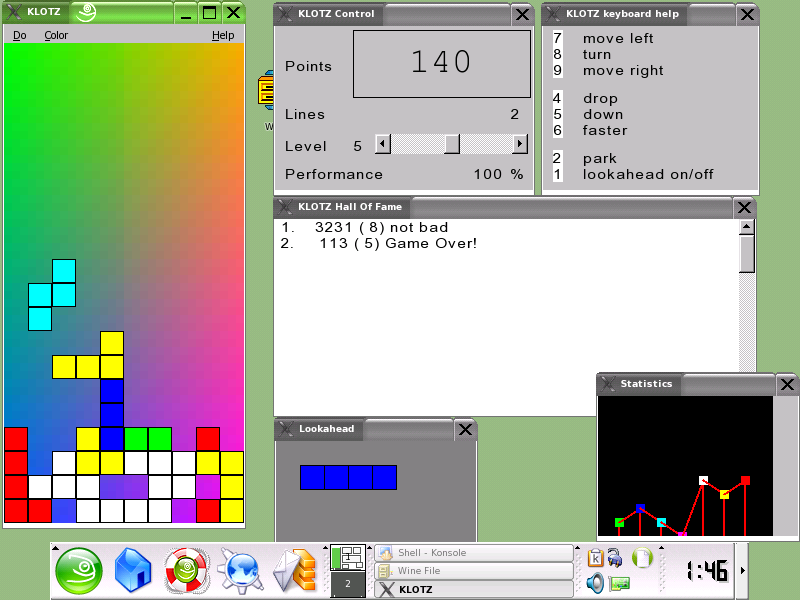 Klotz, an old Win16 (actually Windows 2.x) application that I liked to play. 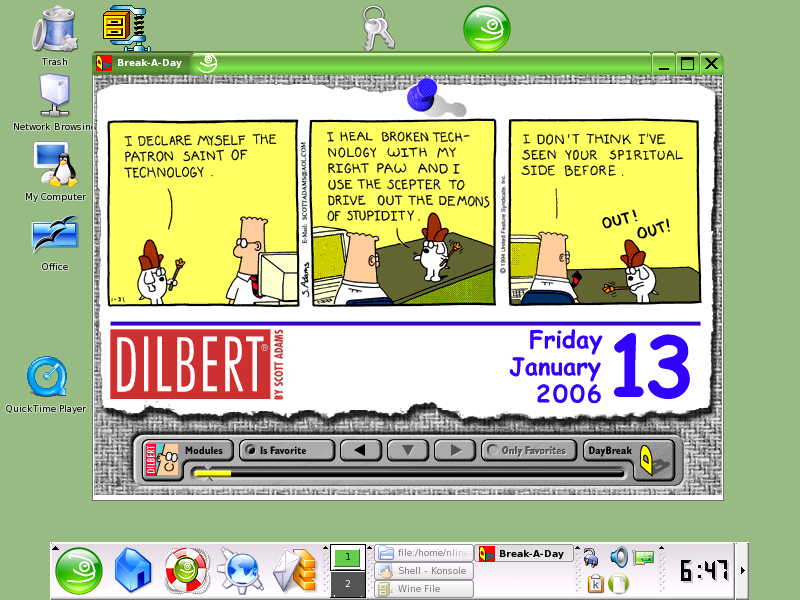 Microshaft Windblows 98 - An old but very funny parody of Windows 98. This time it installed and ran almost perfectly with no tweaking. Normally it runs in full screen mode, but it was easier for me to work with in a desktop window. 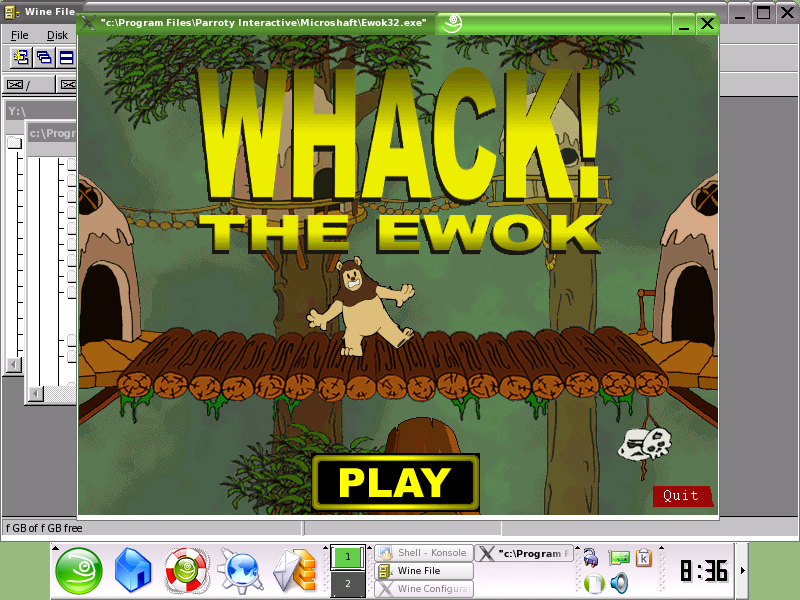 Whack the Ewok - One of several demos included with Microshaft Windows 98 that run under Wine. 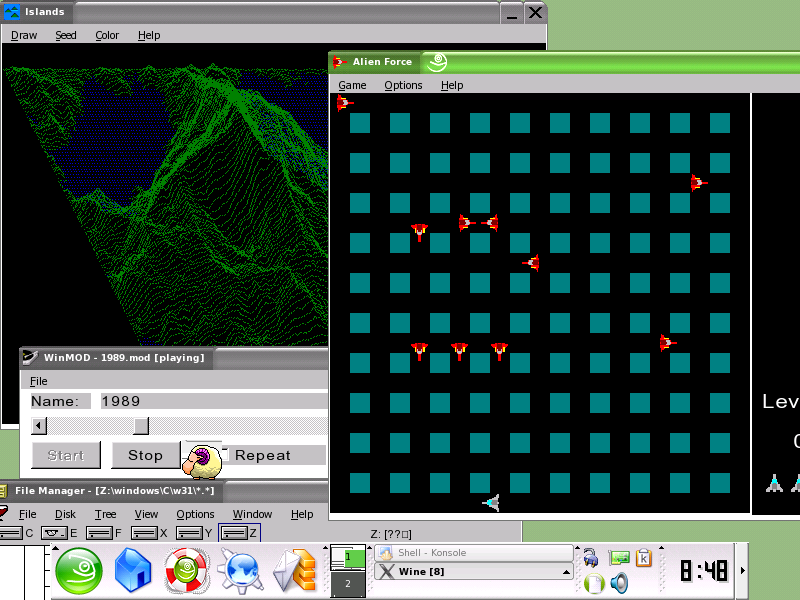 Others include Microshaft Exploder (a cross between Space Invaders/Galaga and Windows crashes) and X-Man (a cross between the X-Files and Pac-Man). PATHWORKS Mosaic V1.00 - An old favorite of mine runs perfectly under Wine. 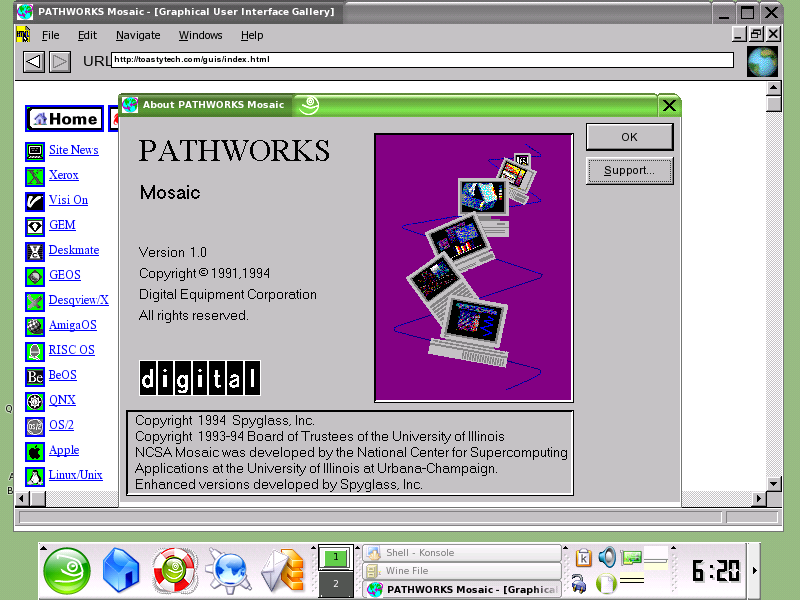 This old Win32s web browser was included with the Digital PATHWORKS 5.1 networking package for DOS/Windows 3.1. 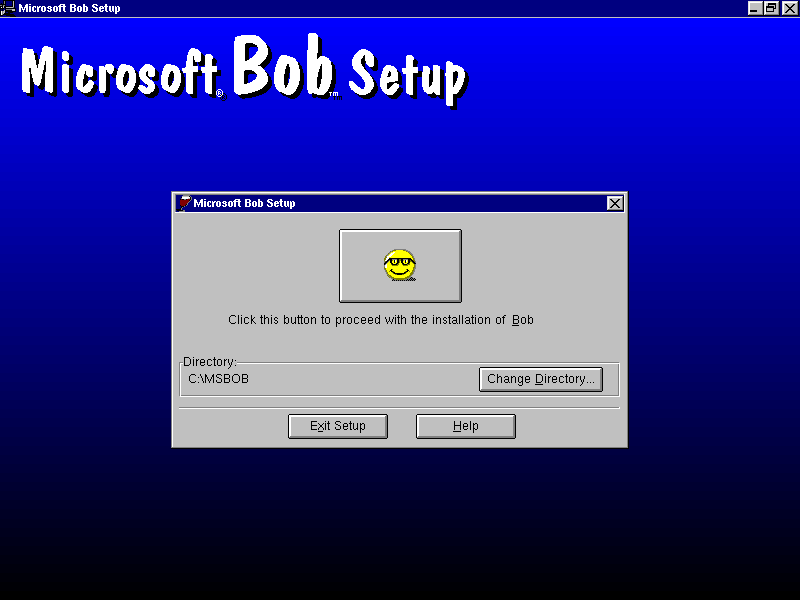 Microsoft BOB setup - Microsoft BOB installs nicely under Wine, however the program itself still does not run. Oh when will BOB run under Wine? I must have BOB running under Wine!